Ie Lily Park is on the western coast of the island. Ie Island, a small island with about 5,000 residents and a 30-minute ferry ride west from Motobu, is known as a quiet getaway with nice white beaches, Okinawa’s largest Hibiscus farm, and tranquil, slow-life atmosphere. Various live performances are scheduled for weekdays and Golden Week holidays. 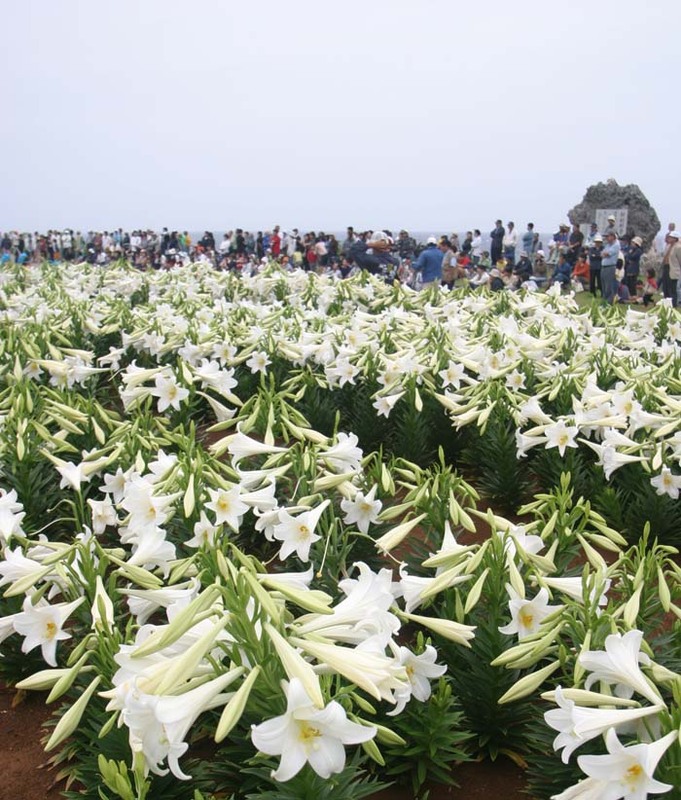 It’s also the home to an annual Ie lsland Lily Festival, that showcases Easter Lilies that cover a park on the west coast of the island with white, fragrant carpet of over one million flowers. The festival runs from Apr. 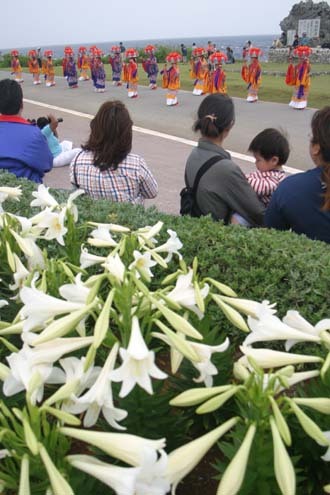 22 through the Golden Week, ending on May 7 with thousands of visitors paying homage to the sweet lilies. Ie Village is not the only lily festival in Japan, but it’s the earliest. 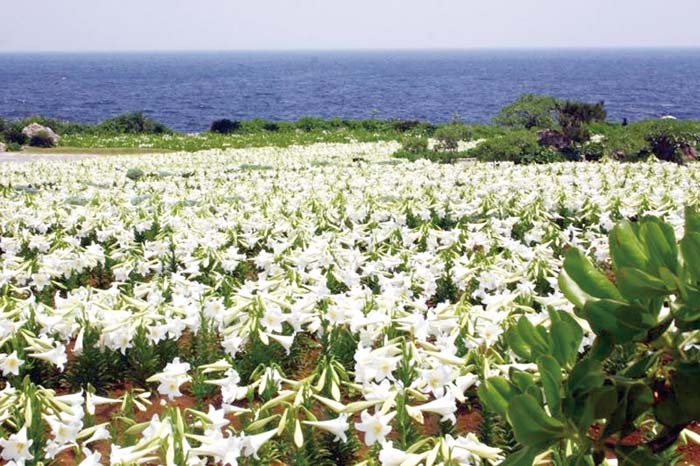 And with the brilliantly white lilies contrasting the deep blue sky and turquoise Okinawan ocean, it’s certainly one of the most magnificent, and an event not to be missed. A variety of events take place during the festival, including music and dance performances on stage on Saturdays, Sundays, and during the Golden Week holidays. And like in all Okinawan festivals, there are plenty of food and drink stalls at the venue. Access: 30-minute ferry-ride from Motobu Port. Round trip fare ¥1,370 for adults and ¥690 for children from 6 to 12 years old. Ferries run frequently from Motobu to Ie Island starting at 9 a.m. At least five runs are available daily, but additional runs will be scheduled to handle Golden Week crowds. The last ferry departs Ie Island at 5 p.m. or 6:30 p.m., depending on the day. Visitors walk on a path winding through the park’s million lilies.